Flower industry is promoting their product by celebrating stereotypical gender roles. I am seeing this and the other two variations of the ad everywhere in Berlin, this one being the most offensive. They usually have names filled in on the dotted lines. I copied this graphic from the official campaign web site. I will no longer wash the dishes. Should you need a glass tonight, take the flower vase, not like we're using it around here anyway. 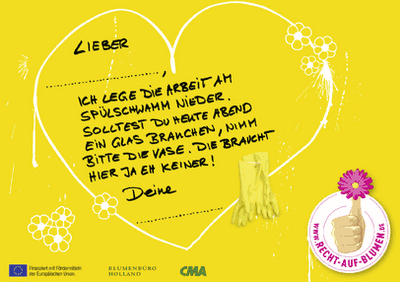 The seal with the thumbs-up on it says "Recht auf blumen" -- "Right to get flowers." Yepp. Want those wenches doing chores without complaint, go buy some flowers, dude! you mean i shouldn't expect my good little wifey to toil away for peanuts, i mean, flowers? 1) no such thing as bad publicity, as calvin klein, abercrombie & fitch, etc. found with their scandalous catalogs. 2) gender stereotypes work pretty well in advertising. @Luke: Yes indeed, there is no such thing as bad publicity. This hardly justifies sexism. Also, in response to comment 2, would you still agree with this statement if it said "Racial stereotypes work pretty well in advertising?" I am glad that our culture has already arrived at a place where such a statement would not be acceptable, even though we are far from racial equality in marketing. I hope to live in a world one day where gender will no longer be a limiting factor for people's life and career choices. you don't think racial stereotypes are used, and very effectively? i'm not saying it's a good thing or that i approve.